Ko Si Chang might be the closest island to Bangkok, but it still doesn’t feature on the itinerary of most tourists visiting Thailand. With its diminutive size, rocky coastline and lack of beaches, most tourists bypass Ko Si Chang as they head for prettier islands on the Eastern Seaboard like Ko Samet or more developed resorts such as Pattaya. 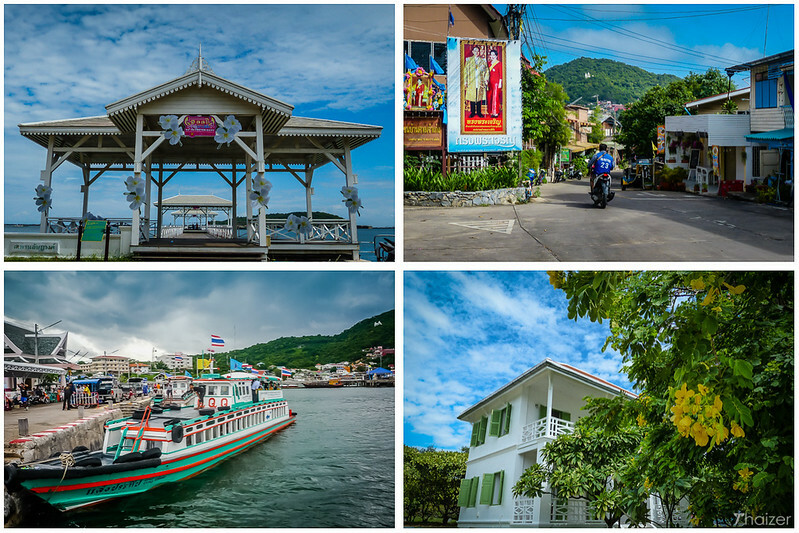 Even during high season you won’t see many foreign tourists on Ko Si Chang, but proximity to the Thai capital does make the little island a popular weekend retreat for Bangkok residents. The main claim to fame for Ko Si Chang is the fact that King Rama V had a summer palace here up until the 1890s. Phra Chudathut Palace was originally a complex of buildings and gardens. Some of the structures have been renovated, but there is a large expanse of open space where the main residence once stood before it was moved to Bangkok in the early 1900s and is now known as the Vimanmek Teakwood Mansion. King Rama V issued a royal decree in 1892 ordering the construction of the royal palace on Ko Si Chang. The Franco-Siamese conflict of 1893 brought a halt to the work and in 1900 King Rama V decided the Phratinang Mantharatanarot mansion on Ko Si Chang should be moved to its present location close to the Dusit Palace in Bangkok where the royal residence was renamed Phratinang Vimanmek. The easiest way to get an overview of Ko Si Chang is to take a tour of the island by samlor. Hotels and guest-houses can arrange this for you, but if you’re visiting on a day trip you can speak directly with the samlor drivers who you will see parked up in their distinctive 3-wheel vehicles when you get off the ferry. Expect to pay in the region of 250 Baht for a samlor tour (they can carry up to 5 passengers) if you want to visit all of the main attraction on Ko Si Chang which will include the site of King Rama V’s summer palace, Wat Tham Yai Prik, the Chinese Shrine (San Jao Paw Khao Yai) and the Buddha’s footprint. Alternatively, you can hire a motorbike and drive yourself. The Ko Si Chang coastline is rocky, but there is a small stretch of sandy beach on the west coast of the island at Had Tham Pung where you will find deck-chairs and beach umbrellas. You can also hire kayaks here and some of the small islands nearby provide good opportunities for snorkelling. If you enjoy walking, there are some good hiking trails on Ko Si Chang (ask your accommodation for a map) and look out in the woodlands for the rare white squirrels which are a symbol of the island. Visitors can see much of Ko Si Chang on a day trip, but if you have time it’s worth spending at least a night or two here to just relax and enjoy the laid-back ambience of the island. Although there aren’t many foreign tourists who make it to the island, Ko Si Chang is a popular weekend destination for Bangkok residents so book accommodation in advance if you are planning to visit during the weekend or a public holiday. I’ve stayed at Charlie’s Bungalows and can recommend it as a clean, good-value and convenient option. Ko Si Chang is an island that caters to its residents so you won’t find the usual host of Westernised food options you see on many of the other Thai islands. You will find plenty of local restaurants and hawker stalls especially in the main town area clustered around the pier and marina. On the road leading to the summer palace, Pan and David’s restaurant has earned a deserved reputation for good Thai and international food. Once you arrive on Ko Si Chang, you’ll soon notice there are very few cars on the island, with most residents using motorbikes or samlors to get around.